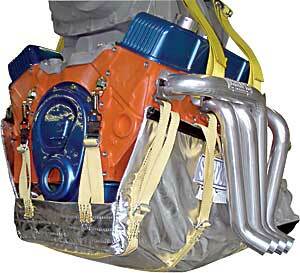 Reduce your worry at the track with an SFI-approved engine diaper from Stroud Safety. An original design by Stroud, this engine diaper keeps engine parts and oil contained instead of under the vehicle when an engine mishap occurs. Comes complete with all the mounting hardware and is ready to install right out of the box. The diaper's absorbent pad is easy to replace so the diaper can be used time after time. Available in popular engine sizes for a great fit.